Up for grabs is a mega-rare 1975 MEGO Falcon 8" action figure for the serious collector. It is sealed on an unpunched, vibrant, near perfect card. The only flaw being minor damage to the top of the bubble (see pics). (in the case of Iron Man and Green Goblin, we're talking the $10,000-20,000 range depending on condition). Falcon, being a lesser known character, doesn't command as much but is still on the same level of rarity and is sought after by carded MEGO completists. the bubble and leaving some minor paint rubbing on the inside from the top of his head but no other damage whatsoever to the card or figure .The aforementioned toy trader immediately clear-taped the top of the bubble to keep dust out and the figure fresh. The Falcon remains otherwise unscathed. It displays great and since the crack is on the top of the bubble, you can't see it looking at it straight on (again, see pics).Otherwise it is a near mint, crisp, unpunched and vibrant card that is straight and clean. A small, light patch of creasing exists on the front but is only visible if scrutinized against reflected light.If the bubble wasn't cracked, this wd be a hard carded Falcon to upgrade ...but good luck even finding one period! There just aren't that many out there to be had. Here's your chance to own one!! Don't miss out! Also includes clear acrylic display case. Good Luck!!! This is a AFA Graded 1979 MEGO World's Greatest Super-Heroes DC Comics Card (1977B) Batgirl Smiling Face Artwork figure. Has a overall grade score of 85 NM+. Original grade score matches current card condition. one comer of symbol is slightly away from fabric , otherwise bat symbol firmly attached to chest. Yes the bubble is sealed all the way around the bubble . it has no broken limbs I can see. Please note the bubble figure and card all graded all 85 each . with overall grade of at 85 NM+ . lastly I'm not a grading company myself and will not " grade" a graded figure. I will try to answer any questions I can . This auction is for a original Mego THE FALCON 8" figure. He is still sealed in the original package. There is a couple inches on the bottom and a couple inches on the bottom right side where the plastic has lifted from the cardboard. There is a crease and some edgewear as shown in the photos. Please look at the photos and ask questions if you have any, I am not at all a expert on action figures. Please check out my other auctions for many more action figures I have listed like spiderman, joker, and many more, some still in the original package., and the Hall of Justice, if you win more than 1 item I will combine shipping. 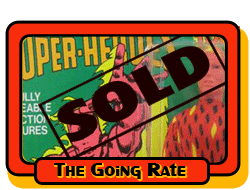 This auction is for a Mego The Falcon 8 inch action figure. This boxed figure is from the Official World’s Greatest Super-Heroes! series, and The Falcon is #51300/4. The toy is original and is dated 1974. It is in the original box and in fine condition. Although this figure is in the original box and may have seen little if any playtime over the years; it is not perfect, the box shows signs of wear and age in the form of various dents and dirt on the box. This is from a large Mego super-hero collection/group that we are listing this week. All the stuff is nice and from one collection but may not necessarily be “archive” quality. Feel free to ask any questions; if there is not enough detail shown up in the photos. In any case, bid with confidence that all are from the 1970’s and would be a great addition to any collection. This action figure was made in the British Colony of Hong Kong for Mego Corp. Wonderland Multivintage is a full time “brick and mortar” vintage department store located in Brookfield Illinois. We buy and sell antiques, collectables, and useable goods in a wide variety of categories. Once we list an item for sale in an auction format, the item will sell to the highest bidder. Wonderland Multivintage will not end an auction early based on any offer received, trades, or customer request. We pride ourselves on customer satisfaction and strive to provide quality goods and quality service. We have over 25 years of experience buying and selling vintage goods. We aim at full disclosure and always try to describe items honestly and accurately. We try to provide well illustrated photos and descriptions and welcome questions and comments at any time. Thank you for bidding and have a great day! MEGO FALCON FIGURE HIGH GRADE MINTY ! THE FIGURE IS IN MINTY SHAPE. I HAVE COLLECTED MEGO AND ONLY LOOKED AT THE BEST OF FIGURES I COULD FIND.THE FIGURE IS ALL ORIGINAL MEGO FROM WHAT I CAN SEE.. THE BODY ON THE FIGURE IS NICE AND TIGHT. THERE ARE NOT RIPS OR STAINS ON THE CLOTHING. THE HEAD PAINT LOOKS GREAT EXCEPT A SMALL SPOT ON THE NOSE.. I DID NOT REMOVE THE FIGURES CLOTHING. FIGURE IS SOLD AS IS BUT IS NOT BROKEN. PAYMENT DUE 2 DAYS FROM END OF BIDDING. 1975 Mego Falcon mint on card and never removed. Factory sealed all around the card including between the feet. The card looks very nice crease on top of card. Bubble has a crack underneath Falcons left foot it goes all the way the whole length of his foot about 1 1/4 in. Displays very nice. Will include acrylic case pictured. I do my best to describe flaws but it's impossible to catch everyone, so if you are super picky please do not bid. The price listed is my best price so please ask questions before bidding because all sales are final with no refunds or returns. US bidders only. Payment expected within 3 days of auctions end. I pack items very well and item will be fully insured. Due to the poor track record I have had with United States Postal Service delivering damaged packages I am using UPS. Original 1975 Mego Falcon WGSH *MINT ON CARD* MOC 100% Original/Sealed ~SCARCE!! Part of the "Official World's Greatest Super Heroes" Line. Card No. 53100/4, known as the "1975a" card. The only card Falcon was produced on. Rich, deep colours on the card - no fading! Bubble is solid, and adhering all around with slight lifting at the top left and right corners. The figure cannot be removed, nor has it ever been. A very, very tough Mego to find in any grade! This is a Type 2 Mego Falcon (Dated 1974). It is over 40 years old. This Mego Falcon Head, Body, Costume & Boots are all Original. There is a small dark spot on the front or the right leg & the back of the left leg of the Original Mego Falcon costume. I have 12 uploaded pictures. So Please look at all of the pictures.